I thought you folks weren’t interested in history bike rides anymore! Then 50 of you showed up for my Remnants and Relics Ride during Pedalpalooza this past June, so maybe I was wrong?  Anyways, that ride was a lot of fun, maybe too much, as we only managed to hit up the spots on the west side before most of you rode home. So along with Dan Haneckow, author of Portland Then and Now, we’ll be doing a Part Two concentrating on the east side of town! Meet us at 2 PM on Saturday October 20th in front of the City of Portland: Archives and Records Management office at 1800 SW 6th Ave (at Montgomery). 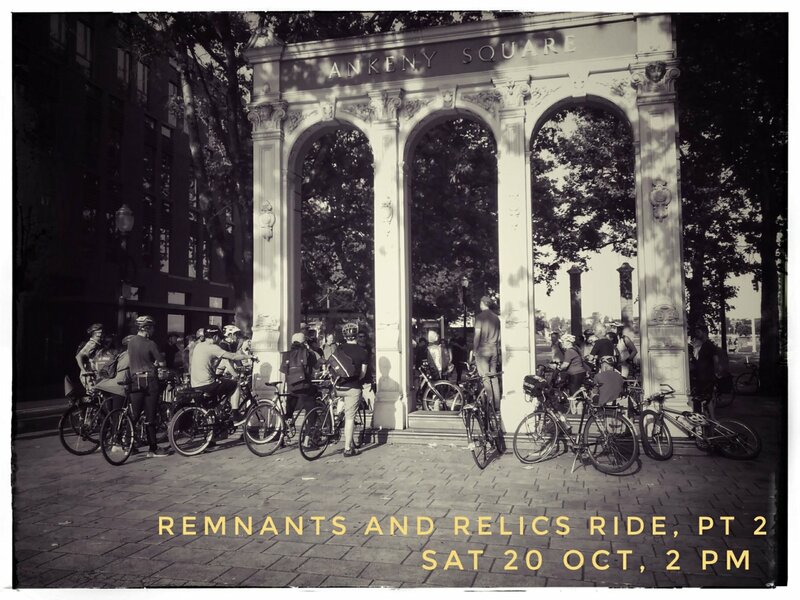 At 2:30 PM we’ll head off on a ten mile bicycle tour exploring the various remnants of Portland’s past, reminders of a bygone era hidden in plain sight! Highlights will include old streetcar tracks, hidden springs, vintage communication, mile posts, and more! Ride not a loop but will end near food/beverage/transit. Bonus! The Oregon Archives Crawl will be happening on the same day, from 11 AM to 3 PM. Check out the three stops on the crawl (one of which conveniently enough is the Archives office) and come on a history ride!